this is pretty cool! I’m going to read more and see if it’s something I can do! You are awesome! The magic number for WS2812b is 60mA per led at full brightness all channels. The H801 is a 10$ led controller made with an ESP8266 with 5 mosfets to control cheaper RGBWW LED strips. It comes with a basic App, or you can flash it with any custom firmware. Hands small enough to clean bits of a motorbike you can’t reach :-) PLus watching them explore and learn stuff is awesome. And they are damn funny too! “Then it pulled too much current through a resistor connected to the regulator” — No, the parts he circled are diodes, not resistors. I have the same board and I accidentally burned out one of those diodes myself, too, when I slapped my screwdriver just a bit too close and it shorted out a couple of pins. One thing I don’t understand is…why did he solder to the regulator, when the VIN-pin already provides the +5V straight from the USB-port? 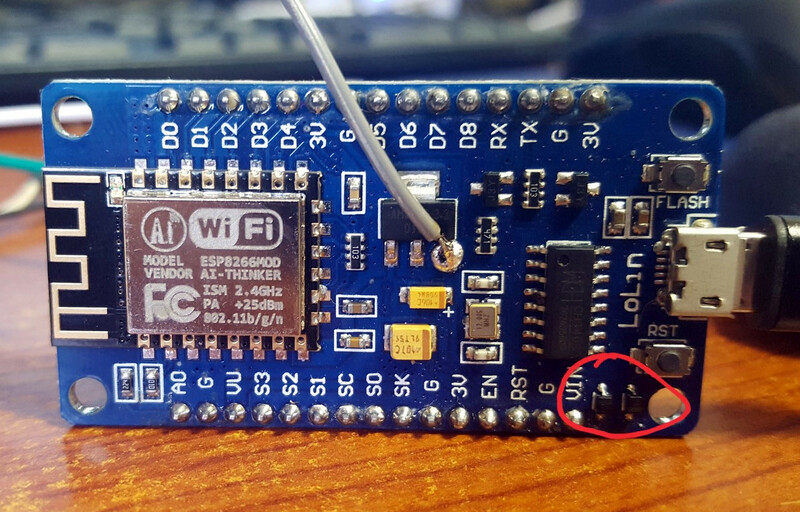 Judging by his solder work, I’m guessing he didn’t feel confident enough to solder to the pin without bridging something. Those are regular 2.54mm pins, much easier to solder to them than those pins on a regulator. I suppose he just never bothered to actually check what the pins do, though he should have; there is no diode between the USB-port and the VIN-pin, but there is a diode between the USB-port and the regulator, and it’s that diode he burned. I have done this using an Esp-01 on the end (begining) of the led strip. I really doubt there is 1k resistor between USB 5V and 1117 regulator input, that wouldn’t pass enough current for ESP. That’s probably a diode since it burned, if it was polyfuse it would just stop conducting. Oh, and 150 those leds … that’s like 9Amps, that’s a challenge not only to PSU but to USB connectors and cables as well. In that case it would be best to connect LED strip directly to PSU, and use separate cable from PSU to ESP board. I haven’t looked at the code, but you don’t have to have all of the LED’s fully on at the same time to get a lot of light out of them. I routinely run them sequentially but at a high rate, and even 50 or less are more than adequate to light up a small room – especially when directed at a light-colored ceiling. In fact I’ve designed a bracelet that uses just 8 of these, and I get plenty of light for a few hours with just a 50mA-hr battery. Yes, there’s not a linear relationship to LED on time and the brightness that we perceive. I ran into this when I was trying to make an led-lit indicator fade out. I decreased the duty cycle of the PWM linearly from full to zero, but to my eyes it looked like mostly fully on with a rapid fade out at the end. I ended up fudging something that looked convincing enough. I built something similar for my living room with a Particle Photon controlling WS2812 strips. The decorative modes are all controlled from a simple phone app, but I also use ifttt to have it turn a night light mode on and off, come on full brightness white when I arrive home after dark, display basic weather info in the morning, etc.